Welcome to our newest feature, Meet the Board. We have been highlighting staff members and alumni, and now it’s time to introduce you to some of our behind-the-scenes volunteers who make it all happen. Just like all non-profits, we have a board of directors who lead us in developing vision and ensuring we have the finances in place to continue offering valuable programs. We could not do what we do without their guidance and dedication. First up, meet Carrie Minnich, FWCC’s Board Chair extraordinaire. Carrie is originally from Goshen, Indiana, and attended Manchester University, where she met her husband John. They were both accounting majors. After graduation, they both accepted jobs at CPA firms in Indianapolis. In 2004, they moved to Fort Wayne, John’s hometown. “2004 was a big year for us, as we moved to a new city, got married, bought a house, and started new jobs all within a few months,” Carrie says. Carrie has been with with Dulin Ward and Dewald (DWD), a CPA firm here in Fort Wayne, ever since and became a director/shareholder in January. She specializes in nonprofits, working with them to make our community a better place to live. She also writes DWD’s Mission Minded blog, a source of best practices for nonprofit organizations, covering everything from board governance to unrelated business income and 990’s. Both Carrie and John are active in the community, volunteering with various nonprofit organizations and attending community events. In addition to serving as our board chair, Carrie serves on The Community Foundation’s audit committee, and she is the advisory CPA board member for the Upstate Alliance of Realtors. 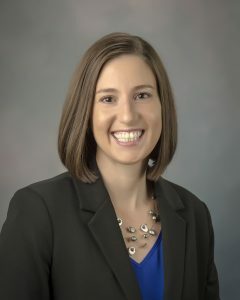 She also serves on the Indiana CPA Society Leadership Cabinet. In her free time, she enjoys running, watching sports (especially Colts and Notre Dame football), and attending community events, Komets hockey games, and TinCaps baseball games. 1- How long have you volunteered for FWCC? I joined the FWCC board in June 2013. When I tell people that I serve on the Fort Wayne Children’s Choir board, they usually assume I either have a child in the choir or have a musical background. I have neither. I grew up playing sports and participating in 4-H, so the Choir is something totally different for me. I think it’s pretty amazing what Jonathan a nd the staff teach the kids. I was asked to serve on the board by a former FWCC board member after my involvement with Foellinger’s Community Interest Grant Review Committee. 2- What were you most surprised to learn about FWCC after getting involved? What the kids know! I attended a rehearsal for the Lyric Choir and was amazed at the interaction between the kids and Pam Pierson and what they were learning. 3- Why do you think FWCC is important to our community? The mission of FWCC is to provide a choral program exemplifying artistic and educational excellence for children from diverse backgrounds, but children participating in FWCC are gaining so much more than a solid music education. FWCC is developing these children to be good citizens. The Choir provides them with an appreciation for music, teamwork, and leadership skills, social skills, appreciation of diversity and creativity. Studies have been done showing that children who participate in children’s choirs grow up to be more active in their community. They volunteer more, contribute more financially to philanthropic organizations, and exhibit greater civic leadership.